The fall semester has been kicking up into gear, so I’ve had less time to work on projects recently. It’s also influenced what I’ve been working on to a certain extent. That said, I’ve still gotten some things done! 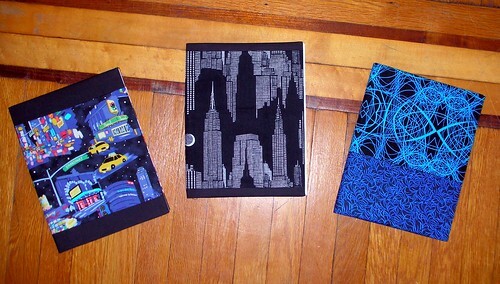 I made three notebook covers for classes, following Rachel’s tutorial on Stitched in Color. I’m going to make one more in yellow and red, to match the Plantagenet colors, for my class on the Angevin Empire. And this time, I’ll (hopefully!) remember to add a pocket before I sew it all together! HST BoM QAL: some progress! 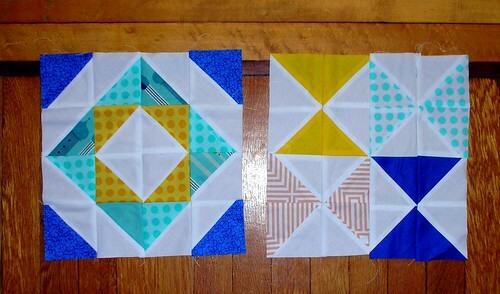 I made the second July block & and my first of two August blocks. -fix botched May block already! 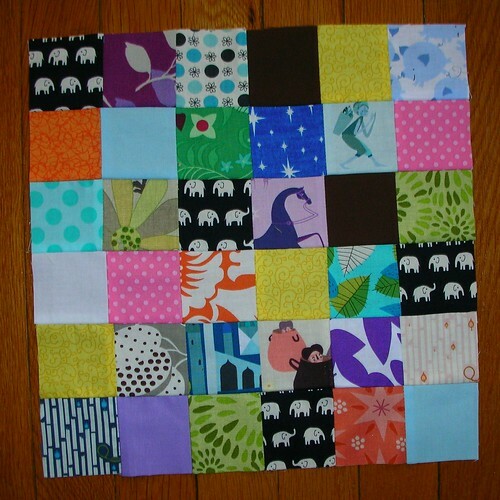 -start thinking about how to arrange the blocks & what to back the quilt with. The more time I spend on the subway going to and from work/class, the more knitting I get done — I may have to take up hand-stitching things, if the majority of my crafting time continues to be on the subway. Perk Me Up Bag: some progress. I finished one side of the bag, which is a patchwork of the various fabrics, and I quilted it, because it’s a lot sturdier that way: I didn’t want to risk knitting needles poking their way through the bag and stabbing someone. -iron interfacing to back of bag exterior and/or quilt it, too. Simple Math: trimmed a few more blocks! Baby K’s Quilt: no progress since last week. This one is what’s laid out on my WiP cart right now, but I keep putting things on top of it — I should just get it done! There’s a bit left to work on. Kitchen Window: no progress since last week. Spinning: no progress since last week. -Merino/yak continues to entice me, but I’m not watching much TV, so not much spinning is getting done. Perhaps I’ll watch a move with friends/family one night this week, to give myself some time off before things get crazy. That might be fun. You share all my crafty passions it seems. I found your blog on WIP Wednesday. How do you like the malabrigo sock yarn? 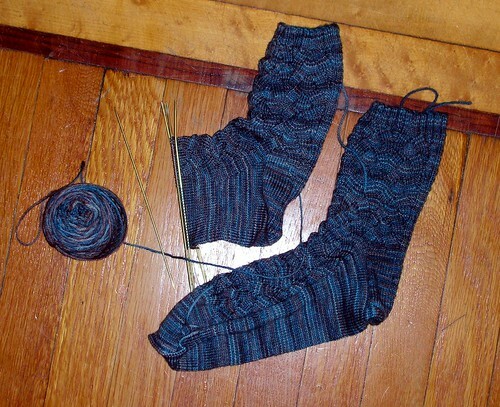 I love the monkey pattern, and the socks look great!